Note:All prices are in US currency unless otherwise specified. Please provide bank check in US dollars with US bank name on front of check, international money order in US Dollars, Western Union QuickPay or credit card form below . Informative brochures on the World Goverment of World Citizens and the World Service Authority are available free upon request! Use item #INFO to order. A US$5.00 Shipping and Handling Fee will be added to orders shipped within the USA. A US$10.00 Shipping and Handling Fee will be added to orders shipped outside the USA. The declaration of World Government. Davis cites Presidents Reagan and Gorbachev as war criminals. States collected from WSA passports since 1954. A US$10.00 Shipping and Handling Fee will be added to orders shipped within the USA. A US$15.00 Shipping and Handling Fee will be added to orders shipped outside the USA. 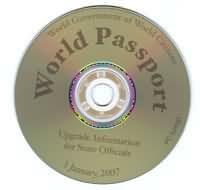 CD contains information on the upgraded, machine-readable World Passport, more than 60 pages of recent copies of visa, entry and exit stamps placed on World Passports, correspondence with heads of state and pertinent organizational information. To order back issues of WCN, go to the order form. Garry Davis never studied law. After graduating from Episcopal Academy in Overbrook, PA in 1940, he entered Carnegie Tech's drama school in Pittsburgh, but left after one year to become a dancer in the Broadway musical "Let's Face It!". His thinking about law began in earnest in 1944 during WWII when the incendiary and demolition bombs dropped from his B-17 flying over German cities. Killing human beings he knew is an indictable crime in civic society. But wars occur in the anarchic space "between" so-called civic societies called Nations. His elder brother having been killed at Salerno, Italy, his first reaction was to avenge his death. The contrast, however, between entertaining people and killing them shocked the former song-and-dance man into reassessing his life's role and mission. It's fundamental legal base was missing. Following the Hiroshima/Nagasaki bombings and WWII, when the prospect of WWIII fought with nuclear bombs between the United States and the Soviet Union seemed imminent, Davis reluctantly but with an almost fanatical determination, turned from actor to "world lawyer." His first legal action was his renunciation of the war system itself by becoming "stateless." The second was to declare himself a "World Citizen." And so the trials began. 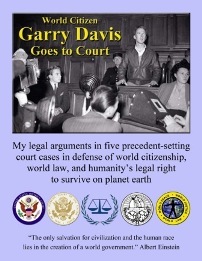 This unique record chronicles his straightforward yet innovative legal defense of "world law," "world citizenship," and "world government," based on fundamental human rights, in actual court cases from the US District Court in Washington, DC through the Supreme Court (where the 9th amendment was key to his defense), on to the International Court of Justice, and finally to a Complaint to the International Criminal Court in 2010 naming 9 heads of state as "enemies of humanity" for their overt nuclear policies, ending with the historic declaration of the World Court of Human Rights in 1974 following a trial in Mulhouse, France, in which he was indicted for issuing a "world passport" based on the human right of freedom of travel. His introduction of (world) habeas corpus in the last two cases derives from Luis Kutner's book, World Habeas Corpus (Oceana Publications, Inc., 1962), this eminent jurist-consul being appointed by Davis "Chief Justice" of the ad hoc World Court of Human Rights first declared in 1974. Dr. Kutner's acceptance speech together with the "First World Citizen's" July 27, 2011 declaration of the de juris status of the World Court of Human Rights rounds out this one-of-a-kind provocative book dedicated to humanity's legitimate planetary survival. A US$20.00 Shipping and Handling Fee will be added to orders shipped outside the USA. World Citizen No. 1 goes abloggin'! But his viewpoint is "out of this world!" looking "down"! Is it really an "Iraq war" from on high? What's the hidden U.S. constitutional amendment sovereign citizens can use to neutralize a president's war powers? Is "humiliation" a precursor to conflict? What would "Space", "Water" and "Sleep" tellus if interviewed? Is "World Money" the solution to our present economic "meltdown"? Does a national presidential election have relevence in a 21st "Nuclear" century? Do billionaires ever "feel" poor? And what's the real cause of war? Views From My Space is provocative, refreshing, illuminating and fun. Davis' eclectic mind wanders authoritatively throughout the human comedy/tragedy as a bird flying above the ever-changing scene below, observant yet detached. The founder/head of the World Government of World Citizens pinpoints with a perceptively roving eye the world moving inexorably toward Armageddon or Millenium as former jagat gurus (world teachers) have prophesied. Garry Davis' exciting autobiography recounts the beginning of the world citizen movement and his travel adventures with the first World Passport. On May 25, 1948, Garry Davis, a former Broadway actor & B-17 bomber pilot in WW II, walked into the United States Embassy in Paris & renounced his United States citizenship. Since that spring day, Davis has claimed to be a World Citizen. Thus began a physical and spiritual odyssey which has many times led Davis back & forth across the globe & which has not yet ended. The story of that odyssey, of the man behind it & of the ideals of world citizenship & world peace which inspired it, is told in this highly dramatic, entertaining & timely book. He has faced the temptation of great power, as embodied in the 20,000 Parisians who cheered his speech in the Velodrome d'Hiver, in the bagful of mail which came to his little strip of no-man's-land between France & Germany, & in the over 1,000,000 people who registered as world citizens, with the support of internationally prominent intellectuals such as Camus, Einstein, Schweitzer & many others. Published in 1992, this "Guide for World Citizens" with complete index draws on Garry Davis' four decades of experience arguing persuasively that individual sovereignty is the key to world peace. This how-to-do-it manual is a must for the active world citizen. In Passport to Freedom, Davis offers timely & practical insights & advice for anyone who agrees that the nation-state system itself is one of the greatest threats to humanity today. Davis argues persuasively that individual sovereignty is the key to challenging the arbitrary war power of nations, & proposes a revolutionary strategy for the growth of a democratic World Government of World Citizens for world peace. Through numerous examples, both from his own action & that of others, Davis demonstates that World Citizenship based on human rights is not merely a noble theory. It works. Thousands of people have used the World Passport described in this book to enter & leave more & more countries & successfully challenge national bureaucrats around the world. For many refugees, World Citizenship often means the difference between freedom & death. A US$15.00 Shipping and Handling Fee will be added to orders shipped within the USA. A US$30.00 Shipping and Handling Fee will be added to orders shipped outside the USA. Now in print again! Garry Davis' revolutionary 1985 text covers every aspect of World Government from conception to workability. Garry Davis has written a book which should be read by all world leaders and opinion makers without delay." WORLD GOVERNMENT, READY OR NOT! is unlike any book we are likely to read this side of the year 2000. Ministers, strapped for a sermon topic, could hardly do better than fill several months of Sundays with readings from Garry's book. It's a must for the law schools, the courses on international law, international relations, the peace researchers, disarmers, and freezers. WORLD GOVERNMENT, READY OR NOT! is the first how-to-do-it and how-it-is-being done book on the making of world peace through government of, by, and for the citizens of the world recounted in masterful detail by a veteran of over 50 years experience in the "field." WWII bomber pilot Garry Davis, in 1948 took Emery Reves (Anatomy of Peace) at his word -- first that "...the ideal of the nation-state is bankrupt.." and second that "There is no first step to world government. World Government is the first step." The eclectic Renaissance Man, stateless World Citizen Davis "lives" the future today treating philosophy, law, economics, travel, space, history and more with equal ease and insight. Moreover, as a world activist, he has seen the inside of over 30 national prisons. E.B. White wrote that "Davis marches to the beat of the Universe while we all march to a broken drum." "The birth pangs of the new world order are already upon us," Davis writes in the Prologue, "and as necessity knows no law but its own, we are too busy attending to that long-heralded and momentous birth to still the shrill cries of infidelity." WORLD GOVERNMENT, READY OR NOT! is a book for the 21st century and beyond. "Garry Davis has written a book which should be read by all world leaders and opinion makers without delay. They should learn from him that man-made boundaries are obsolete, restrictive to human freedom and counter-productive to the cause of peace." "I AM EAGER TO EXPRESS TO THE YOUNG WAR VETERAN DAVIS MY RECOGNITION OF THE SACRIFICE HE HAS MADE FOR THE WELL-BEING OF HUMANITY." A US$25.00 Shipping and Handling Fee will be added to orders shipped outside the USA. A US$35.00 Shipping and Handling Fee will be added to orders shipped outside the USA. Dear World is a rollicking and remarkable global panorama of one man's continuing personal crusade to "live" One World and One Humanity. Besides being a sweeping critique of nationalism, it is a practical guide for anyone interested in world peace through law, the freedom to travel, and human rights. The main locale is Japan where World Citizen Davis landed while on a world tour as a 1988 candidate for US president; informed the Emperor of his unannounced arrival; issued honorary World Passports to Sakharov, the mayors of Hiroshima, Nagasaki, and Tokyo; and thousands of the global document to Southeast Asians working illegally in Japan. Finally jailed by the Japanese Government, he was deported illegally back to the United States?where he was admitted on his own World Passport! Meetings with Presidents Vaclav Havel and Vytautus Landsbergis of Lithuania, Moscow mayor Gavriil Popov and correspondence with Queen Elizabeth (while awaiting deportation in Brixton Prison), Margaret Thatcher, Emperor Akihito and others are fascinating footnotes to Davis' incredible history. Spanning 40 years, beginning with the founding of the UN and ending with his world tour after the Berlin Wall breakdown, Davis covers individual sovereignty, how to become a world citizen, mundialization (communities declaring themselves global units), the World Syntegrity? Project, the exciting new grassroots cybernetic process designed by the eminent cybernetician Stafford Beer to evolve a democratic world constitution, and the continuing, historical evolution of the World Government of World Citizens he founded in 1953 following the sensational events of 1948-50 when the movement began, recounted in his first two books, My Country Is the World and Passport to Freedom. First issued in 1981 to facilitate mail delivery between Nationalist China and the People's Rebublic of China, World Government Stamps feature Raymond Whyte's winged globe design (Mondo) or Guy Steele Fairlamb's stylized globe with junk and space capsule (Cendoj). Available in sheets of 35 or individually. A US$25.00 Shipping and Handling Fee will be added to orders shipped within the USA. A US$70.00 Shipping and Handling Fee will be added to orders shipped outside the USA. National money implies division, hence distrust, exploitation, and war. World money implies world trust, one world, one humanity...world peace. These first-edition World Kilowatt Dollars, (limited to 5,000) numbered, security paper, based on renewable energy, can be bought at the rate of K$10=US$1000.00. At present, they are not redeemable for national currency. Features a full-color Syntegrity(R) Globe on the front. The back says "Let's Syntegrate", and features a balck and white icosahedron. 100% Hanes "Beefy-T", pre-shrunk. 10. "I AM A WORLD CITIZEN" BUTTON! Announce your global commitment in a colorful way with an "I Am A World Citizen" pin. Back by popular demand! A US$2.00 Shipping and Handling Fee will be added to orders shipped within the USA. A US$5.00 Shipping and Handling Fee will be added to orders shipped outside the USA. 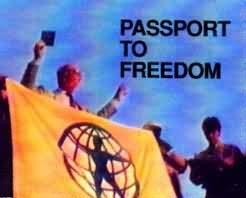 A compilations of talks by Garry Davis on World Government and World Citizenship, covering 1953 to present. 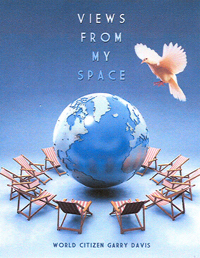 Individual speeches by Garry Davis, spanning four decades of vision, are available in written form at $5.00 (B) per speech. For a free list of available titles, please enter item #1-SP on the order form below. A US$20.00 Shipping and Handling Fee will be added to orders shipped within the USA. A US$40.00 Shipping and Handling Fee will be added to orders shipped outside the USA. The enlightening cartoons of Mark Douglas-Hughes have been compiled into one booklet, now available through NWO Publications. The $20.00 booklet contains all of the strips published in World Citizen News from Mark's first appearance in the newsletter in November of 1991 to the February/March 1995 issue. Shipping Charge Codes: Please check codes next to prices to determine the appropriate shipping charge for your order. For each item ordered, please include the shipping fee per item. Unmarked items do not have shipping charges, but return postage is welcomed. All Catalog orders will be sent by regular mail unless otherwise specified and paid in advance, and will take 2-4 weeks to arrive. Please make checks payable to World Service Authority. You may make donations, pay service fees, and request items from the Catalog by credit card. Please complete the form below and return it to the WSA with the completed application form above. Please include a photocopy of the front and back sides of the credit card. Please note that there are NO REFUNDS or EXCHANGES.